One of the liberating things about the premise of the Doctor Who TV show, is that when you have a central character who is an alien who can travel in time and space it opens up the possibility for all kinds of stories, set in the past, present or far future. 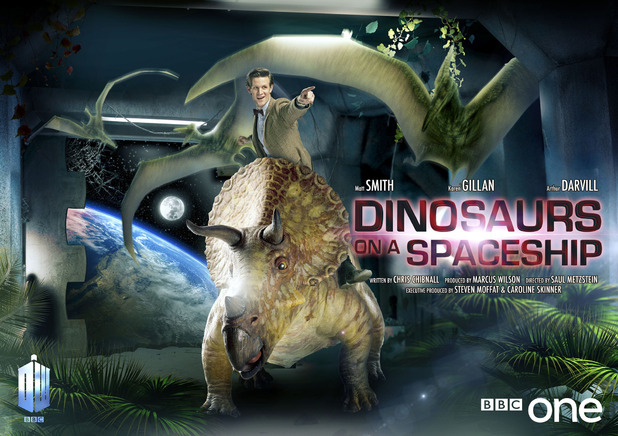 And sometimes you can mix them all up, so you have the past in the future, like in second episode of the seventh season from 2012, 'Dinosaurs on a Spaceship'. 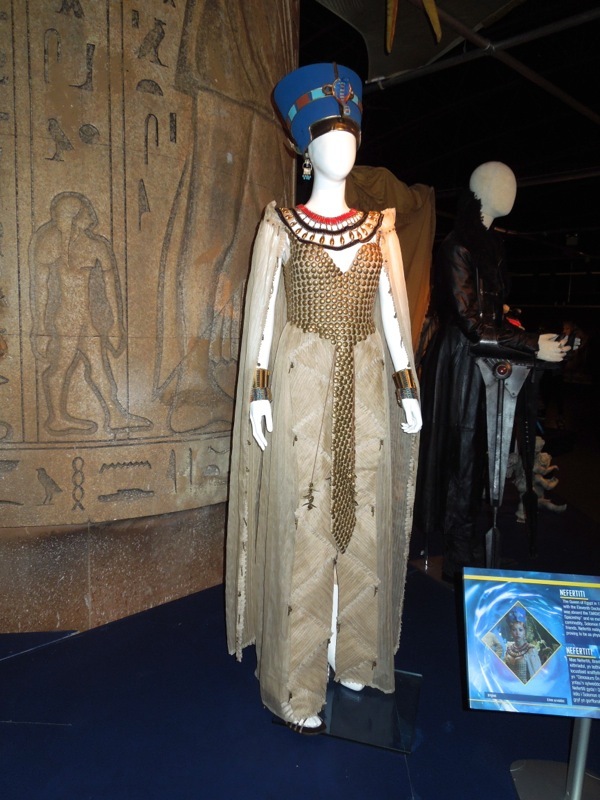 This installment not only featured said prehistoric creatures, but also the infamous Egyptian Queen 'Nefertiti', plus an unscrupulous alien space trader by the name of 'Solomon'. 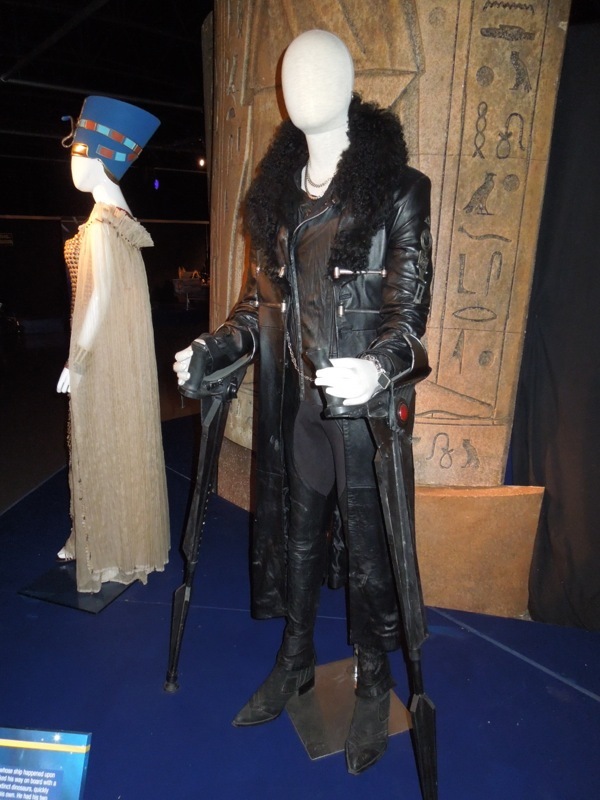 With such a long-running show (Doctor Who will be fifty this year) and on the limited budget of episodic TV, the challenge for the costume department must always be to make the period outfits seem vaguely authentic and the space-faring costumes as diverse and interesting as possible, so the viewer doesn't feel they've seen it all before. 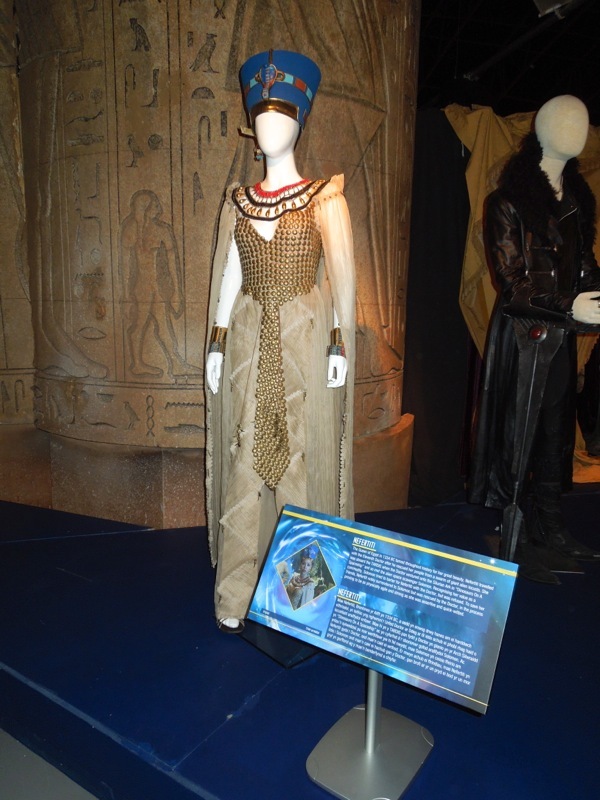 Besides the Eleventh Doctor (Matt Smith), his companions 'Amy' and 'Rory', and even Rory's dad 'Brian', this space adventure romp also sees the Time Lord bring the beautiful Egyptian Queen from 1334 BC along to the futuristic 'Silurian Ark' where the long-extinct dinosaurs are held, after rescuing her people from a swarm of alien locusts. 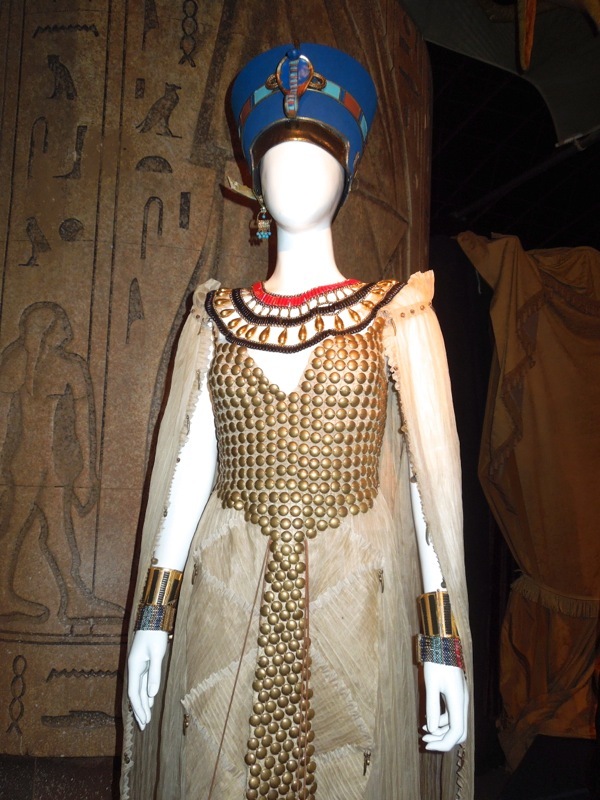 Don't you think this Egyptian outfit designed by Howard Burden would make an excellent Halloween costume? 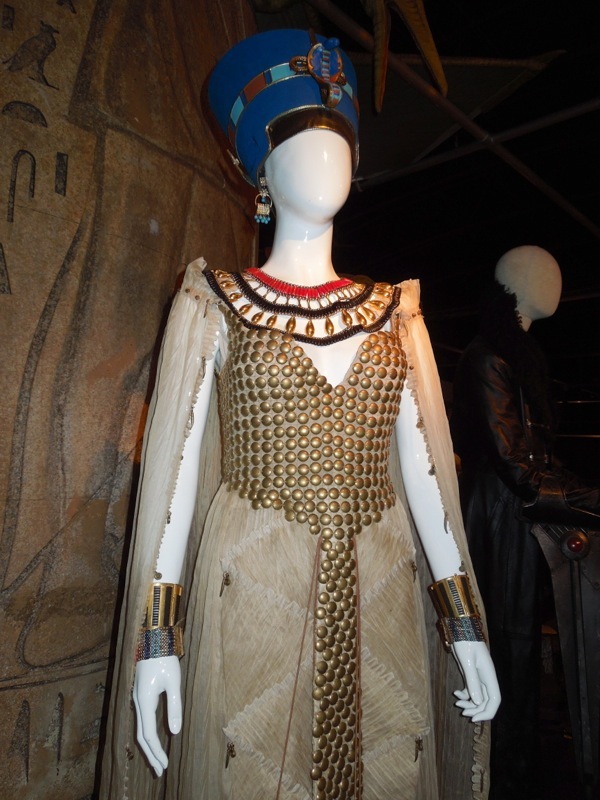 The gold disc material it's made of also reminds Hollywood Movie Costumes and Props of this Sorceress Marique costume from 2011's Conan the Barbarian movie remake. Taking his traveling companions to the future to stop the ark spaceship from crashing into Earth, the Doctor and his friends encounter a black market trader who has murdered the Silurian crew to salvage their precious cargo. 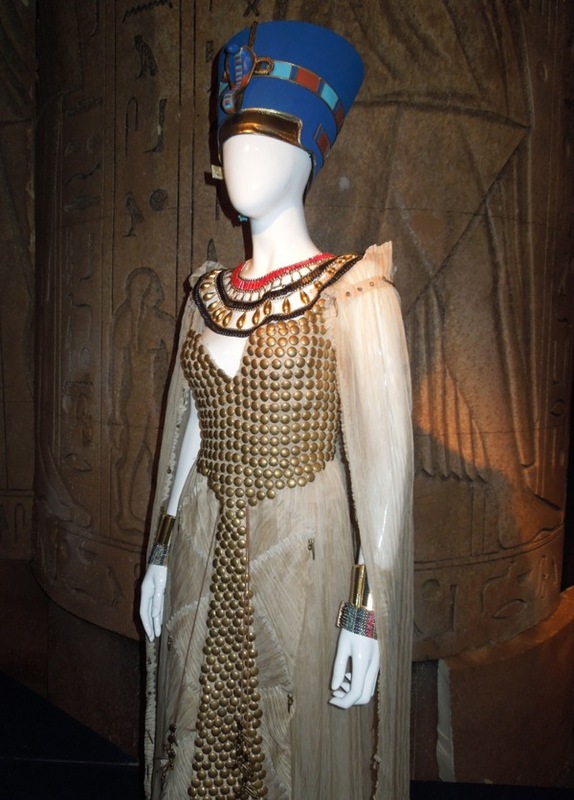 Recognising the value of the one-of-a-kind historic figure, Solomon sets his sights on Nefertiti. 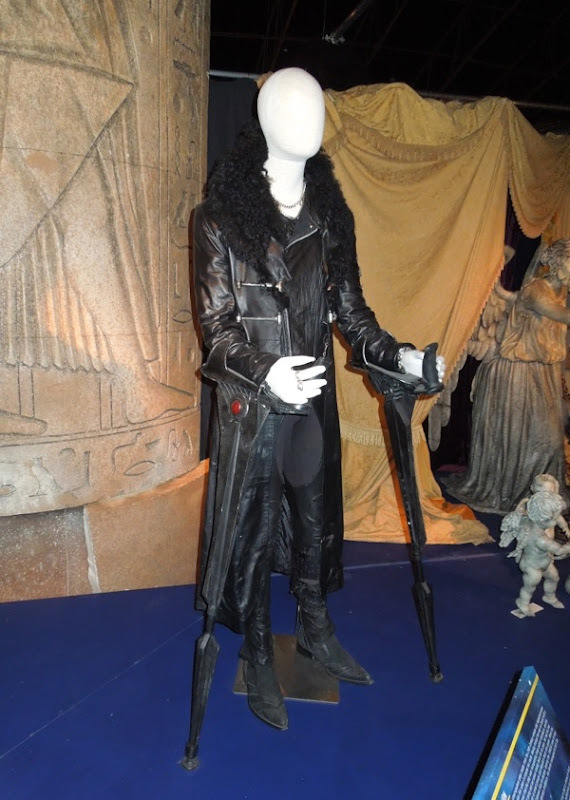 In this episode, the dastardly 'Solomon' was played by none other than Hogwarts school caretaker, 'Argus Filch' from the Harry Potter movies. 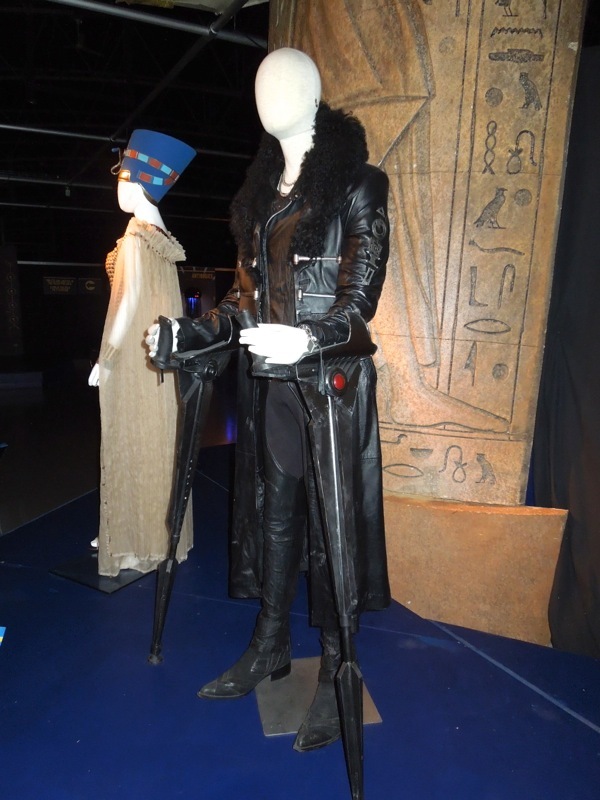 The crutches and all-black outfit with the high ruffle collar really give his character a vulture like demeanor. 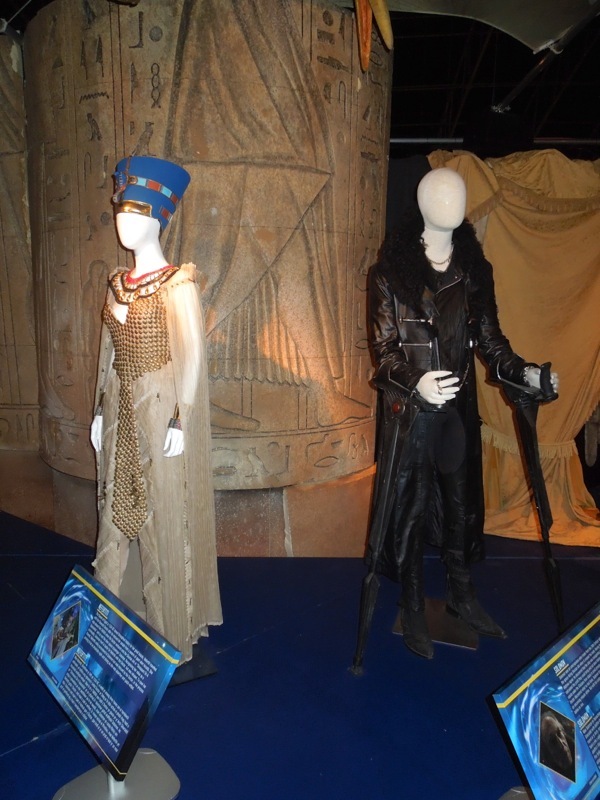 These screen-used television costumes were photographed on display at the Doctor Who Experience in Cardiff Bay on May 20, 2013, so be sure to check out all the other Doctor Who costumes and props that were part of the fantastic exhibit.